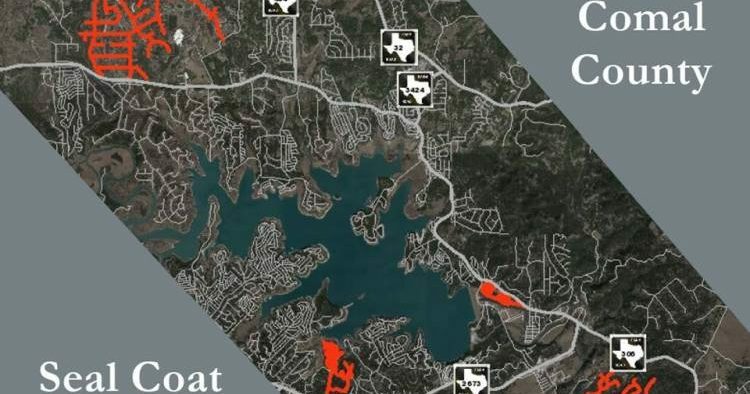 Dozens of roads in subdivisions around Canyon Lake will receive a new seal coat between the end of July and late summer. The Summit, east of the Guadalupe River between the third and fourth crossings of River Road. County crews will do additional seal coating and road maintenance as needed throughout the summer. Mystic Shores north of FM 306 is listed for the seal coat program, but the map with streets highlighted in orange does not include some streets in Mystic Shores Unit 12; Bindweed Lane, Mystic Canyon, Rosinweed Drive, Senna Lane, and Milfoil Lane. There are numerous areas of damaged pavement and pot holes, especially at the intersections and cul de sacs. Are these streets actually included on the list to get the much needed repairs or did they somehow fall through the cracks? Thanks! What about the north part of the lake in Mystic Shores that includes Mystic Canyon and Rosinweed Drive? We haven’t seen anything done to our roads with all of the construction going on in our sub-division.